There are 120 million children not in primary school and nearly a billion people cannot read pages like this one. No one doubts that even a basic education is vital. The UN estimates that earning potential increases by as much as 10% for every year of schooling. Adventure in Missions’ education project originated in Colorado Barra, a remote village that is accessible only by dugout canoe. 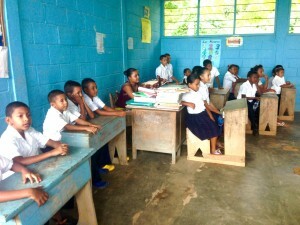 Prior to the project, no one from the community had completed more than grade six. We believed the Lord was telling us that he wanted us use Christian young people who were sold out to Him to change the entire country of Honduras by giving them the opportunity and hope to reach their God given potential. What’s key about education is that it allows people to lift themselves out of poverty. Basic literacy vastly improves a family’s quality of life: they are better able to find jobs, prevent diseases and protect their rights and dignity. It’s not charity, but rather a long-term and sustainable path to development. Join us in seeing this happen, one student at a time! A child’s opportunities are greatly increased with the knowledge of a second language, especially English. 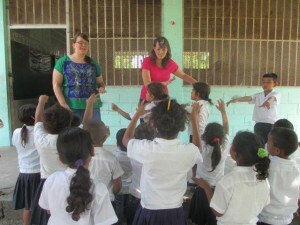 We have partnered with the Honduran school system to provide these life-changing opportunities. Use your simple knowledge of the English language to come serve through teaching elementary, high school, adult, or private classes. 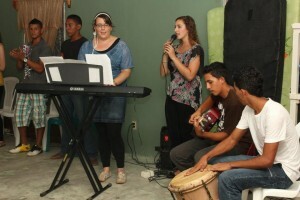 The Honduran culture is full of vibrant rhythms, dances, and songs of praise. We desire to partner with students and churches who desire to sing, play, create, dance, or song-write, but would never have the opportunity to learn these skills or afford an instrument. If you have a love for music or worship, join us in using your talent to teach and create new opportunities to worship the King. 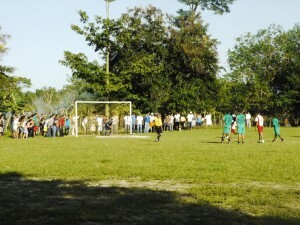 Soccer is king in Honduras. Sports and athletics provide a pass time and learning opportunity for people of all ages. For us, sports provide a great way to share the gospel and disciple the athletes. If you have a passion for athletics, partner with us in creatively reaching the lost right there on the field.